DescriptionStaying in Paris with a toddler? 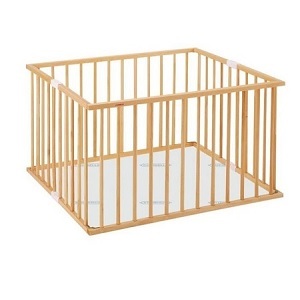 Rent this playpen for your child safety. Supplied with a 9 tiles foam playmat. Need to rent a play yard in Paris for more than 1 month? Contact us for a specific quote. On request of our customers, we've selected this wooden play yard to enable you to leave your toddler in a secure environment for a moment while on family holidays in Paris. Easy to use, foldable - so that you can store it when not in use - we supply this playpen with a full set of foam tiles playmat. Add a bucket of toys rental to your reservation and your child will be a happy baby in Paris! As all our products, we deliver it to your place (hotel, apartment rental, relatives) so that you may enjoy your stay in Paris the easiest way. This playpen is newly referenced within our baby equipment rental products, thus customer comments are not yet available.